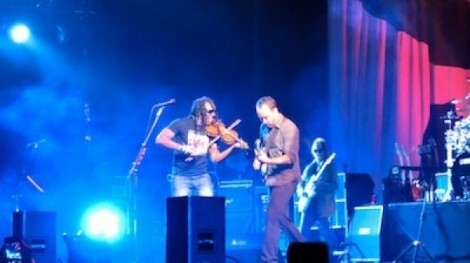 Dave Matthews Band performed at the Usana Amphitheatre in West Valley City on Tuesday night to play new songs from their latest album, Away From the World (2012). Together with The Head & the Heart, they serenaded the aurally ravenous crowd, who had been eagerly awaiting the return of Dave Matthews Band since they last played in Utah in summer 2010. 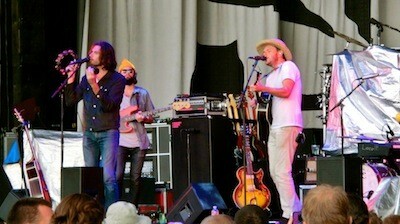 Late-afternoon clouds and rain gave way to a pocket of sunshine and even a double rainbow as Seattle-based indie folk-pop group The Head & the Heart took the stage. They opened the evening with a mix of songs from their upcoming sophomore effort, Let’s Be Still, and songs from their eponymous debut album released in 2010. “Shake” will soon be another show favorite, but the audience cheered the most when “Lost in My Mind” was introduced into their set list. Let’s Be Still is an inspired collection of songs that speak to their experience as they traveled the world to play shows and share their rollicking sound with new listeners. 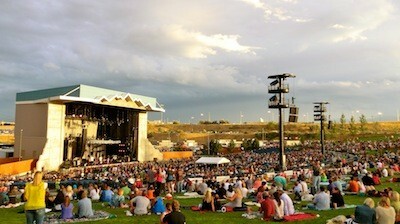 Twenty minutes before Dave Matthews Band took the stage, the sun retreated behind dark clouds and the skies opened up. The rain and wind preoccupied the crowd until Dave Matthews, Boyd Tinsley, Carter Beauford, Stefan Lessard, Jeff Coffin, Rashawn Ross and Tim Reynolds ambled into place onstage, and then 20,000 people simultaneously moved upward and forward as the first few chords of “Don’t Drink the Water” tickled the ears of the starry-eyed crowd. And then everyone forgot about the weather. They played one or two songs from each of their albums, covering a wide range of their considerable catalog, and delighted the audience with classics “Dancing Nancies,” “#41” and “Ants Marching.” Dave’s aching falsetto and Boyd’s truly infectious smile melted many hearts. Noticeably absent from the night was beloved hit “Crash Into Me.” The band seems to have banished it from their set lists entirely, at least for their current tour. Perhaps they are (finally) tired of playing it after 78,176 times. Instead, they offered a squeal-inducing rendition of Blue Oyster Cult’s one-hit wonder “Don’t Fear the Reaper,” and an extended (read: jam session) version of “Grace Is Gone,” with a special appearance by Mickey Raphael from Willie Nelson's band on harmonica. They only played three songs from Away From the World, which marked the reuniting of the band with producer Steve Lillywhite—of the lesser-known underground album that came to be known as The Lillywhite Sessions (2001)—and songs had a decidedly different viscosity than the ultimately released Busted Stuff (2002) versions. Matthews dancing a sort of hillbilly jig during “Cornbread” a la Steve Martin in the ending scene of The Jerk—causing much hootin’ and hollerin’—was a highlight of the evening. This is a band that genuinely enjoys playing live—as evidenced by their relentless touring schedule for the past 20 years. It probably won’t surprise anyone who was at the show to learn that Dave Matthews Band consistently ranks as one of the best live concerts of all time—a distinction that puts them in the same touring echelon as The Rolling Stones, U2 and Madonna. In 2009, Pollstar completed 10 years of research and determined that Dave Matthews Band was the top-grossing touring band of the decade. Melissa McGibbon is an editor for Outdoor Sports Guide Magazine and a member of the Society of American Travel Writers. She is relentlessly optimistic and always in pursuit of adventure, travel or some daring combination of the two. Follow Melissa on Twitter @ambitbrands or on Google+ .